Hjørring Municipality is full of cultural activities - so many that you will always miss something. We have a well-functioning association life and a culture of devoted volunteers that secures engagement and constant renewal of the culture locally. We prioritize art and culture, and we do it because it helps to ensure human value, quality of life and community. We learn about ourselves and each other when we experience art and culture, and it has a positive influence on our mental health. An active and diverse cultural is part of what makes Hjørring Municipality a place where it is attractive to live, work and visit. We have a long-standing, theatrical tradition with many theater associations and a dynamic regional theatre (photo). Therefore it is natural that we host the Aprilfestival - the world's largest traveling theater festival for children and young people. We welcome more than 100 theatre companies, programmers from all parts of Denmark and other guests from Denmark and abroad. And we will do our best to make our guests feel welcome here. Perhaps you will also have time to experience some of the things that make our area something unique. Not least the nature. It is right outside the door no matter where you are. We have a rich and diverse nature that is characterized by the wild coastline and the varied landscape. Here you will find all the things that are unique to Hjørring Municipality: the sea, the wind and the sand. When you are here, you must not miss the newly built Vendsyssel Theater, which was inaugurated in January 2017. 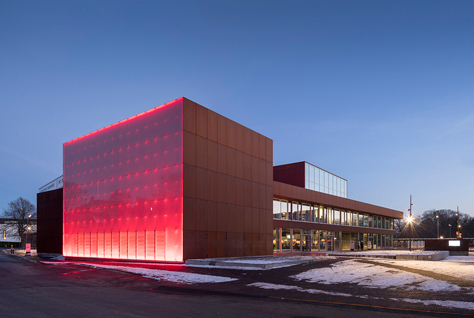 The welcoming atmosphere forms the framework for Hjørring's extensive theater life. At the same time, many other cultural and creative activities take place in the house. It is serving as a place to gather for those who are interested in music, theater and cultural life - amateurs and professionals, young and old. Popularly said, the house is the town's living room. During the festival, this is where you find the Aprilfestival secretariat and the festival café. And Thursday night you can experience the theater's Great Hall when the beautiful festival show takes place. Welcome to Hjørring Municipality - we hope you will have a wonderful festival and a wonderful stay with us!